I agree, this is not the most sophisticated graffiti you've seen on PDP, but I thought it was very cute and, when I saw it, I immediately thought of you (all!). So, let me send you all my loving from Paris (remember the Beatles' song?) Is there a better way of starting the week ? I didn't think so ;-) Today is Monday August 31 and it's definitely the end of the summer vacation. Exhibitions, events, street gatherings... I already have a few photos in mind for you! * sorry for the typos, in the last sentence, and this very long text... in French, but quite easy to understand I think! I can live with that kind of graffiti. Over here, the graffiti we get is all gang-related as I'm sure most is in France). The most interesting graffiti I have seen was in Italy, where someone was adamant that everyone needs to "Stop the war on drugs." yup I remember the song (actually I have the vinyl 45rpm if that means anything in this digital age). Here in the UK its a Bank Holiday - officially the end of summer although the weather is supposed to improve today (its been cold - around 17c for the last few days). Is it just me or did somebody else notice how romantic Eric has been lately?!?! We send you ALL our loving too chèr Eric!!!! Is it just me Eric, or is your heart in the gutter again. Groan... Excellent shot and the b&w puts it all in great focus. Right back at you, Eric. We love you, yeah, yeah, yeah. Merci Eric. The most interesting graffiti I think comes from Brest. 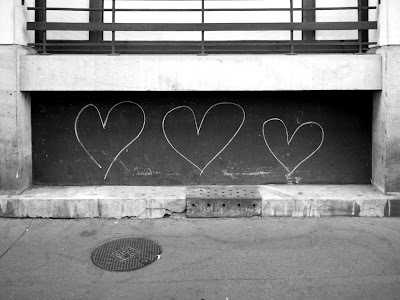 You're right, this isn't the most sophisticated Parisian graffiti you've featured, but it's delightfully heart-felt photo! I'm so happy to hear that Paris is slowly picking up steam after the summer vacation; things should be in full swing by October when I get there! You're right, Eric, not so sophisticated—but totally charmant! And Monica is right—you HAVE been assez romantique lately. What's up? Looking forward to what's to come! You are so thoughtful and have such heart, Eric! Thanks for the love!! Thanks for the love, Eric. Today I need it; returning to work after the summer off. I am a teacher and I know I'll get no sympathy from those who work through the summer, but it is hard to "gear up" after so much time away. On the other hand, it is nice to see colleagues, make a fresh start, and see how much my students have grown over the summer. Eric, this is adorable ~ looks like chalk - graffiti I can easily embrace! Mwah. Don't worry, Eric, all of us love you!!! thanks to you. Today is a very busy day off for me. But I am doing It well and as quick as I can. I so wish I could enjoy the end of the afternoon freely. Back to school for me too Wednesday, Rainie. Wish you super classrooms and students. I am confident this year. All my loving back to you from the middle of the US of A, Eric!!! This photo is great a wonderful way to start the week. Merci. LOVEly graffiti! I like it. You romantic devil Eric, sending me all your loving from Paris... uh? oh it's for everyone? oh ok then that's nice too. lol! Eric - so archetypically urban - so wonderful!!! So sweet!! !Loved listening to the Beatles while viewing another extraordinary slice of Parisian life. Brought back lots of memories! Merci! I like how combined reminders of love, peace, hope and The Beatles! A winning combination. Now I have a lovely song running through my head! Thx, and luv u 2. Ah, Paris and the Beatles together. What more could I want on Monday morning. Thanks, Eric. When I was younger we even crossed hearts to make it feel better. This is awesome, Eric! Thanks for the thoughts, too. I wish they did chalk heart graffiti here, too. The rain could wash it away, and it could be done all over again! You have a great eye and a great heart, Mr. Tenin!! Awwwwww Eric...what a guy!! That is a great pic and a great song as well. I'm sure the Universe is sending a shipment of love back to you!! You deserve it!